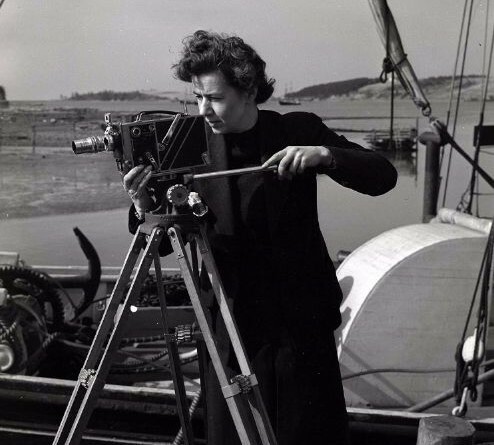 Still, there were those who managed to cut through the patriarchal power structure to carve out careers as directors, pioneering women such as Muriel Box in England, Maya Deren in the US, Agnes Varda in France and Ida Lupino in Hollywood. To that list you can add the name of Nova Scotian filmmaker Margaret Perry. Born in New Brunswick in 1905 and recruited in 1942 by another maverick, John Grierson of the newly minted National Film Board of Canada, the then recently widowed Perry took to professional motion picture production like the proverbial fish takes to water, building a lengthy and distinguished career at the Nova Scotia Film Bureau from 1946 to her retirement in 1969. For many of those years, she was the film industry in the province, recording footage of landmarks like the building of the Canso Causeway and the Angus L. Macdonald Bridge in Halifax, all for more than 50 short industrials, travelogues and pastorals. Shooting in 16mm and initially handling all the post-production work on her films, Perry won plenty of awards and had her films seen all around the world. Like her Bluenose contemporary, the folklorist Helen Creighton, whom she filmed hauling her heavy tape recorder around the province, Perry often traveled on her own, cranking out films on miniscule budgets with little fanfare. The result, however, is an impressive body of motion pictures that profile a Nova Scotia which seems very far away today. A quick look at her greatest film, the award-winning Glooscap Country from 1961, reveals a visual acuity and powerful sense of place that informed her work. Recounting the Mi’qmak creation myth in fourteen minutes or so, Glooscap Country provides a ravishing rush of nature imagery to accompany the stories of Nova Scotia’s flora and fauna as they scurry about under Glooscap’s gaze. It’s a remarkable film that still seems as mesmerizing as when I saw it first in elementary school in the mid-1960s. Meanwhile, Perry, who died in 1998, has become something of a myth herself. The subject of a mid-1980s NFB documentary by Shelagh Mackenzie and Les Kriszan, Perry had long since drifted into a retirement where she was disinterested in recalling tales of her singular ventures into filming in Nova Scotia. Many of Margaret Perry’s films are available online through the Public Archives Of Nova Scotia. They are worth seeking out by any Nova Scotian interested in filmmaking, for they form a crucial part of Nova Scotia’s motion picture history.